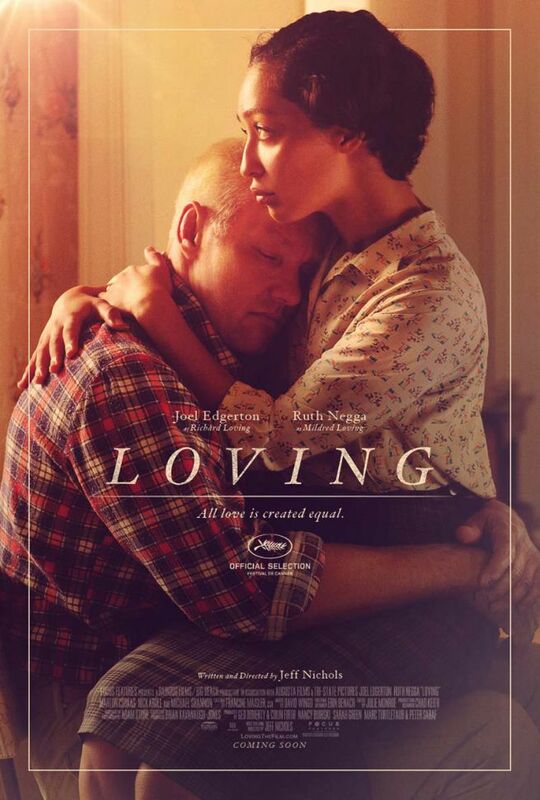 Loving, the new film by Jeff Nichols, tells the story of an interracial loving couple struggling to be accepted in a society where segregation laws still exist. The live in Carolina, a state that doesn’t recognize interracial weddings. So they go to get married in Washington D.C. but aren’t allowed to come back to Carolina, their home state, to live there as a legal married couple. Their story will finally catch the attention of the Civil Rights movement and will finally become the icon case that will make the law and the constitution of the United States change. The interracial couple is wonderfully portrayed by Joël Adgerton (the wonderful Lucas in Midnight Special) and Ruth Negga. The film is brilliantly directed by Jeff Nichols (Take Shelter, Mud, Midnight Special) and beautifully lit by Adam Stone (who also lit the previous films by Jeff Nichols including the amazingly lit Midnight Special). There is a very nice pace to it, a pace that allows the audience to become intimate with this couple and identify with them and their struggle. There is also a permanent tension that underlies the film. Another masterpiece by Jeff Nichols who is definitely one of my favorite filmmakers.